New GY-HM850 3-CMOS optical system delivers pristine HD images to solid state memory while the camera streams live video and audio via Wi-Fi or a plug-in LTE modem. 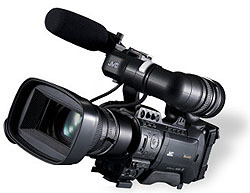 Whether you're shooting news, commercials, sports, documentaries or special events, JVC's new GY-HM850 is your first choice in an affordable high-performance shoulder camera. Its new 3-CMOS optical system delivers pristine HD images to solid state memory while the camera streams live video and audio via Wi-Fi or a plug-in LTE modem. It features a removable 20x Fujinon auto-focus lens, 4 channels of audio, dual memory card recording, and a new virtually lossless 50 Mbps recording mode. With the GY-HM850, you'll be First On-Air and First On-Line. Rush to the scene with the ProHD GY-HM850 compact shoulder camcorder and deliver the news faster than ever. Wirelessly backhaul via FTP or stream LIVE over a Wi-Fi or 4G-LTE/3G network. Record on cost-effective SDHC/SDXC cards, in HD or SD, including simultaneous recording in two different resolutions. You can even stream and record at the same time. Save time and money getting breaking news on the air with the GY-HM850, and stay on top of the action. Record in today's essential Full HD, or SD for legacy applications, with native support of MOV compatible with Apple Final Cut Pro, MP4 and MXF formats to accommodate a wide range of workflows. Onboard dual SDHC/SDXC card slots ensure that you have virtually "unlimited" recording capacity in the field. Win the race to get breaking news on the air. LIVE streaming and FTP backhaul transfer over Wi-Fi or 4G-LTE/3G networks give you the edge. Since FTP and LIVE streaming clients are built into the camera, all you do is plug-in a USB network adapter and you're ready for LIVE delivery. The GY-HM850 is equipped with a newly-developed Fujinon wide-angle 20x zoom lens offering one of the highest magnifications in the industry. For superior low-light performance and assured brightness at the tele end, the lens offers F1.6-3.0, a focal range of 29mm - 580mm (35mm equivalent) and includes servo zoom, along with manual focus and iris rings. Optical image stabilizer and chromatic aberration correction are also built into this interchangeable 1/3-inch bayonet mount lens. At the heart of the GY-HM850 are three 1/3-inch 2.07 effective-megapixel CMOS sensors, each capable of capturing full HD 1920 x 1080 resolution images. Featuring 12bit processing, an excellent sensitivity of F11 (60Hz) / F12 (50Hz) and a remarkable signal-to-noise ratio, the devices provide superior precision and color reproduction with minimal aberration. For improved CMOS sensor performance, flash-band compensation is also supported. FALCONBRID™ is JVC's high-speed processor for advanced video applications. Delivering tremendous processing power, the on-board FALCONBRID™ engine processes large amounts of video data at exceptional speeds. Together with this technology, superior image quality has been realized with 2D DNR processing and dynamic range compensation circuitry. The GY-HM850 supports both the popular MPEG-2 Long GOP 35/25/19Mbps format widely used by television broadcasters, and the highly efficient AVCHD progressive format, which provides compatibility with a wide range of affordable NLE systems. This means that professionals have unprecedented flexibility to meet production standards through a wide range of workflows. The dual codec also enables the GY-HM850/HM890 to offer simultaneous HD/SD or HD/Web recording, producing full HD files on one memory card while creating smaller, Web-friendly files on the other. 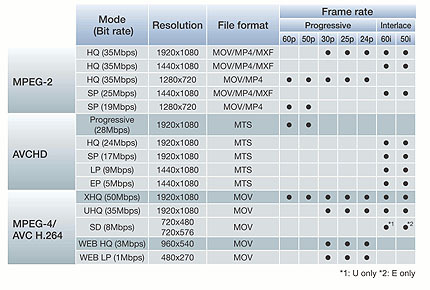 Also supported is the MPEG-4/AVC H.264 8Mbps SD format. The GY-HM850/HM890 is also equipped with the H.264 Extreme-High Quality (XHQ) 50Mbps (MOV) recording mode used in HD SLRs. MPEG-4 AVC/H.264 offers approximately twice the compression efficiency of conventional codecs, and offers superior motion prediction, so even at the same bit rate it provides a smooth and detailed picture with virtually no block noise even when recording rapid action sequences. Added to this, the 50Mbps bit rate is high enough to support full 1920 x 1080 encoding in 60p or 60i, resulting in stunningly detailed HD images. Record HD or SD footage directly in ready-to-edit QuickTime™ MOV files, the native file format of Apple's Final Cut Pro™. Native file recording ensures your footage is ready to edit the moment it's shot, resulting in a more efficient workflow with lossless quality. 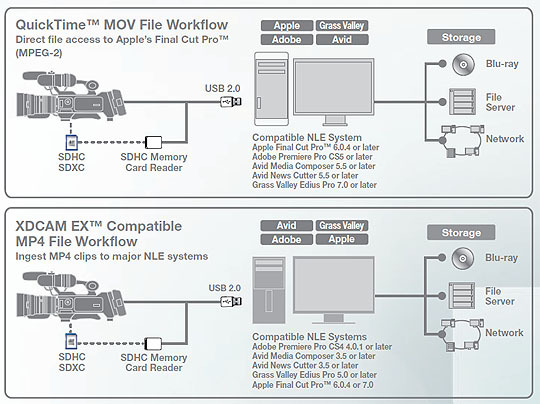 For direct editing in other major NLE systems such as Avid Media Composer, Adobe Premiere and Grass Valley Edius Pro, it is also possible to record XDCAM EX™ compatible MP4 files for a likewise seamless native workflow. The GY-HM850 features the shoulder-mount form factor that professionals often prefer, in a size that remains compact and light despite its massive capabilities. This combination contributes to stable shooting over long durations with less fatigue. Handle zoom and REC button are also available from low angle shooting. The high-resolution 1.15M-pixel 4.3" LCD monitor displays a wide variety of monitoring and setup indications. The GY-HM850 is equipped with a high-resolution (852 x 480 x 3) LCOS (Liquid Crystal On Silicon) 0.45" viewfinder. The 16:9 image is crisper and more detailed than conventional LCD viewfinders, with higher vertical resolution and superior RGB color separation. When Focus Assist is switched on, the image in the viewfinder of LCD monitor switches to monochrome and all objects that are in focus appear with colored edges (selectable from red, green or blue). Keeping important elements in the picture in focus while shooting is greatly simplified. The GY-HM850 features ProHD's highly intuitive GUI navigation system, providing easily accessible menu items and customizable settings to match individual preferences or demands of the moment. With Pre Rec enabled, the camcorder continuously buffers up to 10 seconds of video, so that when recording is started the cached video is included in the recorded file - keeping you from missing a crucial shot because you didn't hit the record button in time. Interval Rec allows you to record single frames at set intervals to capture time-lapse recordings of street traffic, construction sites, growing plants, etc. 25p or 30p. Under-cranking in the MPEG-2 1080p 35Mbps mode is also possible. The GY-HM850/HM890 meets the needs of professional applications with cutting-edge connectivity. For easy monitoring of footage, you can monitor from the digital 3G SDI and HDMI outputs simultaneously, easily switching between output in HD or SD. 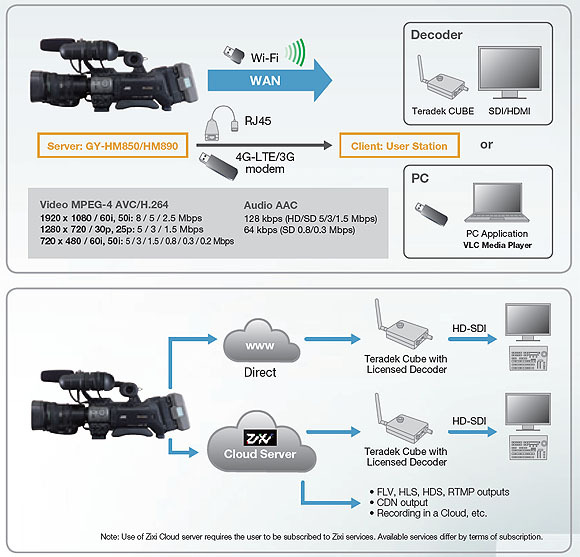 In addition to JVC's proprietary wired remote control system, the GY-HM850/HM890 also supports LANC remote controllers for flexible camera operability in a variety of setups. Equipped with genlock input and timecode in/out terminals, GY-HM850/HM890 can be easily integrated into multi-camera setups. The ProHD Clip Manager for both Mac and Windows makes it easy to manage MP4 clips on the GY-HM850/HM890's memory cards from your computer. Copy, move, delete, preview clips, and edit clip metadata. JVC offers a distinct advantage of having the network connection engine built-in. So it's only necessary to connect either a Wi-Fi, 4G-LTE/3G modem or USB-RJ45 adapter to the USB host interface. No optional backpack is required. LIVE picture can be viewed on a smartphone or tablet (Android, iPhone, iPad). What's more, REC/PAUSE and ZOOM functions can be controlled from the smart devices via Wi-Fi. Planning metadata and clip metadata can be edited at a smartphone or tablet and transferred to the camera via 4G-LTE/3G* or Wi-Fi. A GPS unit is built-in, enabling location information to be recorded as metadata along with the video data. *1 The camera requires a global IP address in 4G-LTE/3G mode for RTSP/RTP connection. *2 Subscription to Zixi services required.